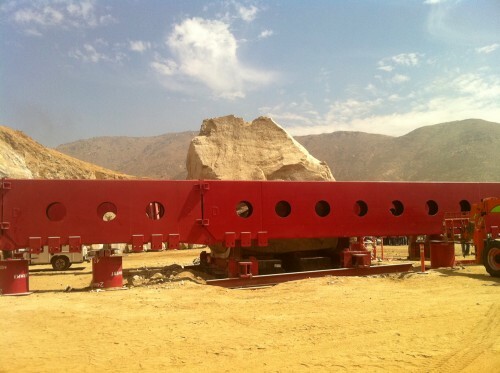 If all goes according to plan, sometime in early October an enormous boulder will leave a Riverside, California quarry and a couple of weeks later roll onto the grounds of the Los Angeles County Museum of Art, to become an installation called Levitated Mass. In 1968, Michael Heizer, the artist behind Levitated Mass, made a drawing of a rock he hoped would one day emerge from the quarry he had been visiting. Decades later in 2007, the boulder he’d been looking for tumbled out of its granite escarpment. The 21½-foot-tall rock came to rest several yards from the quarry face. 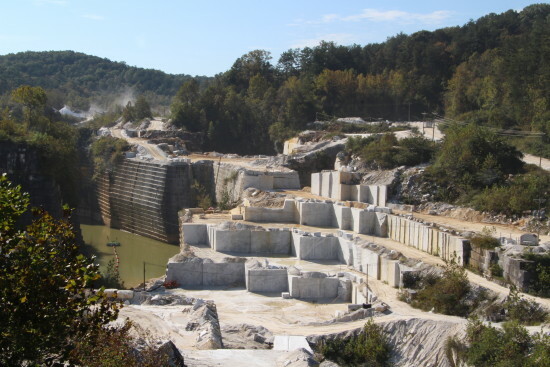 “It was quarried up top, and they pushed it with 2 bulldozers and a Caterpillar loader 300 feet. That’s how we pulled it off the mountain. 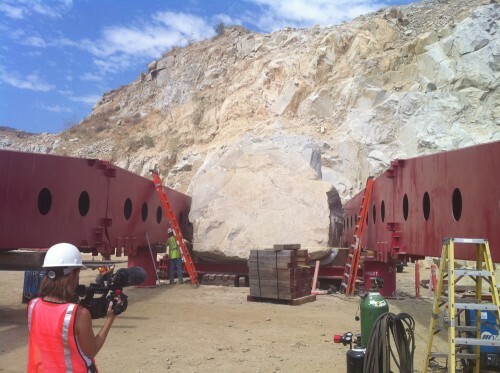 But when it became a work of art, they had a big cradle and crane to move it,” remarked Stephen Vander Hart, the head of Stone Valley quarry, who seems both pleased and anxious to see the boulder leave his custody. It has taken nearly five years of fundraising and engineering to work out how to move the rock the 85 miles to Los Angeles. To get from quarry to museum, the 340-ton chunk of granite will be slung on thick cables suspended between two 127-foot-long steel beams and hauled at a snail’s pace by a Kenworth truck in front and an Oshkosh military transport from behind. Each truck is capable of producing 550 to 600 horsepower. The entire rig, front to back, will be 273'-10" inches long. LACMA says the rock is the “largest monolith moved since ancient times," a lofty claim no one could really prove or disprove. Still, toting the 670,000-pound boulder requires Emmert International (the firm building and driving the rig) to construct a transporter consisting of two hollow beams of welded and gusseted T-1 laminated steel. Each beam is roughly 2 feet wide, tapering from 40” up to a height of 6’-9”. The beams, which have been pieced together on site around the boulder, are made up of five sections that will be drawn together by bolts along vertical seams. When closed, the seams push against each other, like the keystone in an arch, becoming stronger because they are in compression. When completed, the beams will be connected by cross members and trusses, forming a 26’-7” wide saddle that will sit on 22 dollies with remote control steering. A total of 196 tires will bear the load. Empty, the rig will weigh nearly a half-million pounds; fully loaded about 1.1 million pounds. It will lumber, by night, at an average speed of five miles per hour. “It’s just a big rock,” said Rick Albrecht, Emmert’s supervisor for the move. “I’ve seen most of the route so far. We’ll do it,” he added flatly.